Light emitting displays, including LCD, OLED, Plasma and other technologies, all suffer from a visibility problem when used under conditions which include high ambient lighting levels. A common condition is exposure to uncontrollable outdoor lighting, such as kiosks, advertising displays, control towers and aircraft cockpits, to name just a few. The solution is to increase the luminance of the display well above normal levels expected for indoor use. The display contrast must be increased to maximum, as well. Because of these measures, precautions must be taken to avoid direct specular reflections from the display surface. Several technologies have been developed to improve the situation. One of these technologies is film lamination. General Digital Optical Bonding Laboratories can passively enhance a display by applying optical films to its front surface, thereby improving brightness and contrast by reducing surface reflections. General Digital Optical Bonding Laboratories is a National Distributor of Tigold Films (formerly known as OCLI). We also integrate films from other third party film manufacturers. Laminated to the front surface of the LCD panel. Can be performed either directly in-the-frame or under-the-frame. General Digital prefers the under-the-frame method to reduce risks of delamination. Reduces surface reflections, thereby improving brightness and contrast two to three times without actually making display brighter. Reduces surface reflections, thereby improving brightness and contrast two to three times without actually making display brighter. Softens direct light source images in reflection. 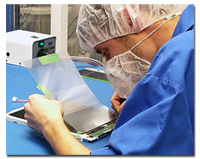 Laminated to the front surface of the LCD, OLED or Plasma panel. Can be performed either directly in-the-frame or under-the-frame. General Digital prefers the under-the-frame method to reduce risks of delamination. 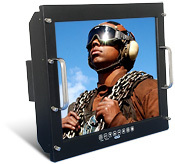 A view-control film designed so that only the operator can see the display, thereby keeping sensitive information private. The image on the screen will appear black when viewed beyond 30 degrees right or left. Reduces and controls viewing angle. Reduces light directed beyond viewing angle. Redirects light and retains data privacy. Reduces reflected ambient light more than the emitted light, thereby increasing contrast of the display. Alters the output color of the screen. Can be used to trim the output for special applications. For further information regarding optical film enhancements or to request a quote for your application, please contact one of our qualified Sales Engineers.